Despite Supreme Court order banning even government from demanding Aadhaar, private schools insist on it ignoring privacy concerns. 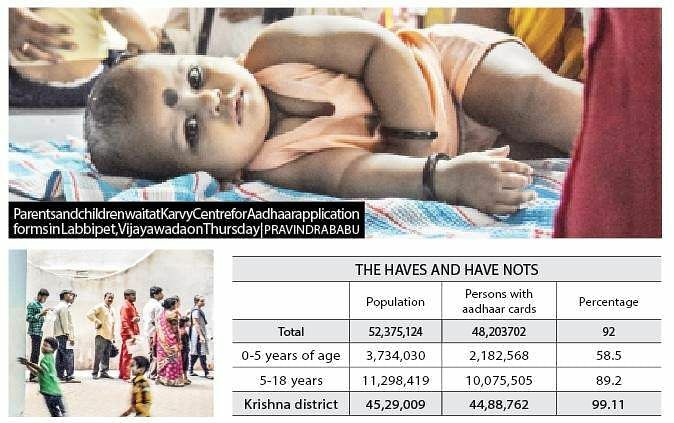 VIJAYAWADA: T Durga Prasad has been standing in queue for an Aadhaar application form with his three-year-old daughter for close to four hours. “This is my second visit to Karvy Centre this week,” he says. His previous visit was apparently unsuccessful as only 150 application forms are distributed per day in the city. “I had initially gone to the centre in Patamata, but the officials there told me forms were being given only at the Labbipet office. I was shocked to see the queues here!” explains the father as his cranky toddler tugs at his shirt. “It is bad enough that we have to wait long hours, what makes it worse is that there is no one to provide proper information here except for a security guard,” fumes Prasad. Ahead of him are 50 odd persons, including 14-month-old Hitesh and his elder brother of four years who fight animatedly even as their visibly tired mother Sravani tries to pry them apart. The sudden surge in the number of Aadhaar applications is because nursery admissions have begun in the city and private schools are asking for Aadhaar details in admission forms. This comes in the backdrop of the Supreme Court Constitution bench preparing to hear a batch of petitions on the validity of Aadhaar next week. It had earlier passed an order banning the government from insisting on linking of Aadhaar to avail benefits of various schemes. 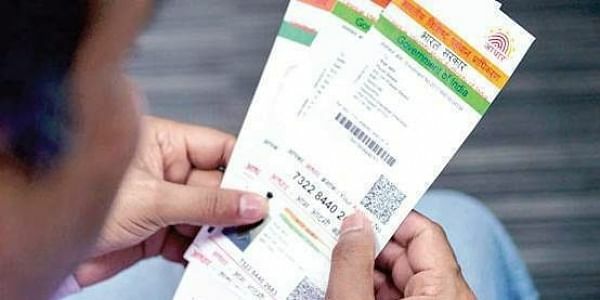 The Centre had responded saying it had no plans of making Aadhaar mandatory at least until March 31, 2018. Despite the government having said so, private schools in the state are pressuring parents. It is being debated whether the institutions will be able to ensure that the confidential information remains secure. Lawyers TNIE spoke to confirmed that it was illegal for schools to seek Aadhaar details. “According to the SC order, no organisation can do so before April. In fact, parents can register cases against schools for putting them through this ordeal,” says Hyderabad High Court advocate P Raviteja. Conveniently ignoring the order are a few schools. When contacted, V Bhargav Kumar, a principal who did not want his private school’s name to be quoted, claimed the management was asking for the details only because the Education Department had directed so.“Education Department officials have instructed us to take down the details while enrolling students. As far as privacy is concerned, we will keep every detail confidential,” said Kumar. An official of the department confirmed that they had demanded the details. “Yes, we made Aadhaar mandatory for the enrolment of students. In government schools, students will be availing benefits of various schemes. To regulate that, Aadhaar is a must. Similarly, in private schools, for security reasons we have made it mandatory. We will do our best to keep the details secure but as it is a government decision, we hope better arrangements will be made,” superintendent in charge of private schools Srinivas told TNIE. Education experts too have strongly opposed the move. “Firstly, we don’t support the government’s decision of insisting on Aadhaar details for government schemes including midday meals. Now, it has gone so far as to make private schools demand for Aadhaar details too. This is ridiculous!” left party leader and MLC Balasubramanyam said.